Dentures are one of the many alternatives for restoring your teeth’s functions and beautiful smile. They provide relief to those who have few or no remaining natural teeth as they take the place of the missing teeth. Hence, it is a great inconvenience and uncertainty if dentures are broken. That it is possible for them to break anytime only adds to the uncertainty. You cannot speak, eat, or continue your every day life without them. At Bendigo Smiles Dentist, your trusted local dentist strives to address this dental emergency through a Same Day Emergency Appointment, which is usually available. We work tirelessly to relieve you of your inconvenience. Let’s take a look at the common reasons why dentures break and the first aid steps that should be taken if they do. 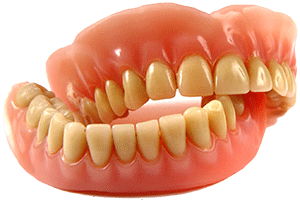 Your dentures are made of sturdy materials designed to withstand damage for a long time. Over the years that you use them, they are exposed to pressure from your activities – eating, chewing, and grinding, to name a few. These weaken your dentures and can cause damage. Just like your natural teeth, your dentures need proper care. They shouldn’t be used as tools other than in normal eating. Biting down hard on something hard can cause them to break. To keep your gums healthy while wearing dentures, you are advised to remove your dentures every night and let your gums rest. Every time you remove them, they are exposed to outside risks that can damage them. They may fall and break, or be misplaced and break as well. Accidents happen, whether we like it or not. Dentures are known to fall out regularly if they are not properly fitted to you. Hence it is important to only go to your trusted Bendigo Smiles Dentist to provide you with your perfectly fitted dentures. The first thing to remember when your dentures are broken is that you cannot repair them yourself. Even if the issue is only a small crack, do not attempt to fix them. Resorting to over-the-counter denture repair kits can only further damage your dentures and make it harder for your dentist to fix them. Repairing dentures requires the expertise and skill of a dentist. In case they are broken, the best thing you can do to return to your normal functions is to schedule an appointment with your dentist right away. Bendigo Smiles provides families in Bendigo with instant, effective relief from dental emergencies. We offer general care and urgent care for families and patients of every age. Our clinic offers safe pain-free methods to promote comfort and relaxation during procedures. Our team prioritise your needs and overall experience, whether it’s a simple visit or an emergency situation. Same Day Emergency Appointment Usually Available! Call us on (03) 5441 6447 or request your appointment online today!